Want to start CrossFit training but worried you won’t be able to keep up? Our after-school athlete program helps prepare you mentally and physically in a welcoming environment. A lot of anxiety about CrossFit training comes from two factors: the fear of being intimidated by those who are already well-versed in all things fitness, and the fear that you won’t be in good enough shape – mentally and physically – to keep pace. Those fears end today. At CrossFit Streets, we welcome individuals of every experience level to come in and train, encouraging an open community in a clean, hygienic, family-friendly facility. That attitude and approach led us to create our after-school athlete program, a class that focuses on helping participants put themselves through the paces of getting into better mental and physical shape so they can take on CrossFit training, and life in general, with confidence. 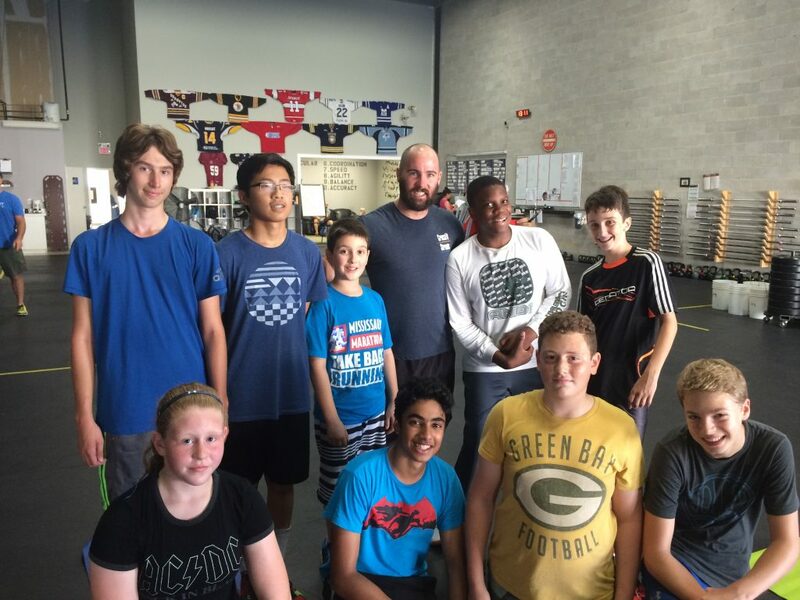 It’s a strength and conditioning program that makes workouts fun and educational for young athletes. Build your mind and body for CrossFit with help from our highly educated training staff. So who’s teaching these classes? Who’s putting together this program and leading the charge of helping young athletes get geared up for CrossFit? Our after-school athlete program is run by an extremely educated staff of fitness trainers who all have at least 6 unique certifications. After-school athlete classes are held Monday, Wednesday, and Thursday at 4pm. They’re not only a constant source of help and encouragement – they’re also a partner, a person just as dedicated as you are to ensuring you get in the proper shape and gain the confidence you want. They place an emphasis on safe, fun training that’s designed to move each participant closer to their fitness goals. Our gym is clean, tidy, family-friendly and conveniently located in Mississauga. CrossFit Streets holds hygiene to an extremely high standard. It’s also ideal for family members who want to watch or wait, as we offer a space for them to hang out during workouts. We can be found at 2905 Argentia Road in Mississauga, a convenient location that can be easily accessed from several nearby roads and cities. Want to learn more about we help you whip your mind and body into shape? Contact us today! 3 Visits Per Week Contact Us! The CrossFit after school athlete program is an amazing program for anyone who want to be fit or are on any kind of team, and are looking to improve themselves physically and mentally. The after school athlete program is a great place to start being a healthier person. This program also helps to boost your self-confidence and physical performance. It is a safe environment for kids and teens to learn and practice CrossFit movements and to learn how to use weights properly. The coaches and other athletes make everyone feel welcome and there’s no prior experience required. Everyone learns and progresses at their own pace. I myself have completed 2+ years in the after school athlete program and have moved into adult courses. The after school athlete program is a great easy to get familiar with the movements at a young age. Overall through the program I improved my physical fitness, boasted my self-confidence and felt great about myself as a young athlete. This program is for everyone interested in bettering themselves. Crossfit Streets is a great place and Dan and Tara are doing something wonderful to help the community get on the right track to health and fitness. Jordan and myself have been a part of Crossfit Streets for a couple of years now and although I am not there as often as I would like to be, due to my work and travel schedule, I am glad to be a part of it and workout whenever I can . Our son started the after school athlete program in 2015 when he was 13 years old. Over the past 2 years we’ve seen a tremendous improvement in not only his physical fitness, but also in his self discipline and self confidence. The work ethic he developed at CrossFit Streets helped drive him to find a part-time job and achieve better grades in school. He even entered a couple of CrossFit competitions with his friends from Streets, and we find that he now really tries his best at all aspects of his life. Before I joined the After School Athlete program, I wasn’t very athletic and I was not very happy with my body and my physical strength. When I showed up to my first class, I was a little nervous but it ended up being fun. The other kids in my class were really nice and friendly. The coaches are nice and super encouraging. They always make you push your limits and do your best in all the workouts. I decided to enroll in the program and I quickly started seeing progress. I was in much better shape and I was getting stronger every day. Now, two years later I can lift some pretty heavy weights and I can run a 5k without struggling and walking. I’ve made some good friends through CrossFit Streets and it’s been a great journey so far. Overall, joining the After School Athlete program has probably been the best decision I’ve made in my life so far.